A simple design that's devilishly clever at messing with you. I'm tracking my doom through the fuzzy static of a whirring camera. The security office I'm in barely surpasses a shoe closet in size. Outside, I'm being hunted by a gang of animatronic animals bent on jamming my head into their smiling maws. I check the cameras again. Two small pinpricks of silvery light—they're unmistakably eyes—return my stare from a dining room blanketed by shadow. A low chuckle rumbles between my ears. I wonder again how I would ever think taking a nightwatchman's job at a children's pizzeria was a good idea. 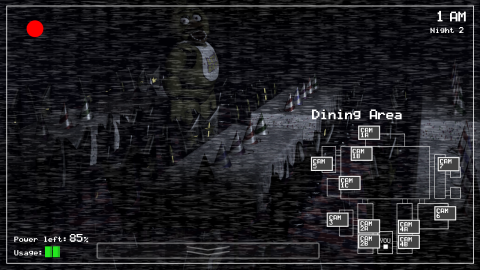 Five Nights at Freddy's gets clever with its simple presentation. It turned my sense of awareness against me, relying on my mind tricking itself to override logic. Those brilliant moments during my five hours playing it typically came after I fought down the urge to curl into a whimpering ball of tears and sweat. It's a first-person horror game, but the boogeyman jumping out of the closet isn't its payoff—it's the creeping buildup of dread watching that doorknob slowly turn. The only objective is to survive five nights (and a bonus sixth night) from midnight until 6 AM chimes on the clock, a round length of about eight to nine minutes. Four robo-mascots—Bonnie the bunny, Chica the chicken, Foxy the pirate fox, and the titular Freddy Fazbear—meander or beeline to the security office. The only means of defense are two metal doors, a pair of flickering hallway lights, and a camera monitor screen that stretches across your entire view when pulled up. All you can do is swivel the watchman's head via the mouse, operate the doors and lights, or flip through camera emplacements. All those 'only's make it sound shallow, but believe me: They're components of a frightfully effective nightmare machine. Keeping the bots at bay drains power from a battery, and conserving enough juice to last the night is FNAF's challenge. It's impossible to keep the battery topped off. Idling away the hours and not touching anything (a very foolish thing to do) still ticks down power from an overhead light and a nearby spinning fan obviously too far away for me to reach over and turn off while I'm scared out of my mind. The walking suits won't enter the office right away if they get close, which is enough time to shut a door and block their entry. But you can't just turtle by keeping both doors closed indefinitely, as switching on lights and locking doors puts extra strain on the battery and drains it faster. It's so easy to make mistakes in judging the amount of battery life left to use. I caused a couple of white-knuckle moments early on after zealous use of the doors depleted the battery right at 5 AM. I didn't meet an immediate game-over, but the room plunged into darkness, the fan sputtering to a stop. Absolute silence—until I heard a music box version of “Les Toreadors” tinkle away with Freddy's toothy grin lighting up in one of the doorways like a twisted Cheshire. A few seconds later, and the tune abruptly cut off into silence again. I waited for my grisly end with quiet dignity and a brain screaming against my skull to ohnohelpmehelpmehelpme . The wait wasn't the excruciating part; knowing I was helpless against a murderous electronic bear standing a scant few feet away from me kicked in some serious fight-or-flight queasiness in the stomach. Just when I was sure of being eaten alive, the clock struck the hour, and I could hear a bunch of kids cheering my success. One night down. Loud exhale. Change pants. That's a clear example of how FNAF masterfully leverages the knife-point balance between rational decision-making and panicky flailing. It feels unfair from the start—enemies are mobile while I stay put, no weapons, and crappy visibility—but that's all it is: a feeling. The tools provided handily net victory with smart use. Slip up somehow, and you'll be punished. Where FNAF separates itself from its jumpscare-heavy ilk is a near-overwhelming fear of the threat of a jumpscare. That doesn't mean the bulbous-eyed antagonists aren't scary in their own right. Their lifeless gazes at a camera or through a doorway packs serious uncanny valley vibes, and they excel at toying with my sanity with their incessant smiles and raspy moans. Figuring out the travel and behavior pattern of each character is critical for making it through multiple nights, but that sense of security only goes so far when victory relies on temperance rather than luck. The weight of paranoia grows heavier as each hour slides by. It's like peering into a pitch-black stairway descending into a basement and feeling that prickle on your neck of something watching you just out of your vision. Once all the enemy patterns are figured out, however, FNAF falters. There's not much more to expect beyond managing battery life and careful timing of slamming doors shut, so those with steely willpower won't find anything else past the atmosphere of it all. After the first couple of nights, I stopped checking every camera and focused on areas where most of the monsters tended to pass through at some point (usually the exterior halls leading into the security room). This slightly diminished the pressure of keeping track of everything, and it would've been nice to have every camera carry equal importance instead of checking just one or two sections. Five Nights at Freddy's takes the less-is-more approach. The AI isn't some masterwork of procedural unpredictability, but it doesn't need to be. It'll head straight to you and eat your face off, or it'll play around like an innocent child before closing in for the kill. Your mind will fill in the rest.